Does The Legal Genealogist even have to mention these are the best records out there? Finding an ancestor’s name in a court record is like winning the genealogical lottery! Is there any reason to look at court records in that case? 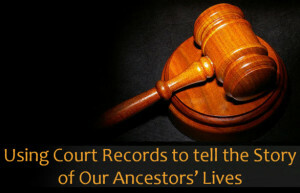 Come on along Wednesday for Using Court Records to tell the Story of Our Ancestors’ Lives, a free webinar sponsored by Legacy Family Tree. We’ll talk about court records and how they can be used to flesh out a family history even if your ancestors aren’t mentioned in them even once. I wont be able to make the “live” session, but I’ll watch the recorded version Wednesday night. Glad to have you on board whenever you can make it! I’m looking forward to it – there’s always something more to learn about court records! I am too, Claudia — and I hope everybody learns something they didn’t know before. I know I did, preparing this! I watched your webinar today and found it fascinating. Thank you! Thanks so much for the kind words, Laurie!